Deborah does these glitters so well.... love this one! Two coats wasn't quite enough to I added a third and it was PERFECT. I added a coat of Gelous before my my topcoat to help smooth it out. Another blogger mentioned she got some staining from Razzle Dazzle, but I did not. I used an Avon mineral basecoat that I think has been discontinued for a while, and it seemed to keep it from staining for me. 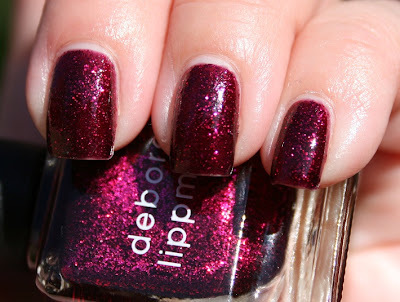 This polish definitely stained on me :( It looks amazing on you though! I'm glad you made it work!